The annual International Culture Celebration for students, faculty, and staff took place Nov. 16 in the Student Center. Students from 18 cultural groups shared about their home country through displays, photos, food, and music. The MSU Office of International Programs coordinated the event. 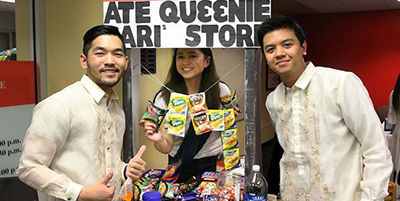 MSU students, pictured on the right, pose by a booth displaying information from the Philippines. The annual Northwest International Festival of Music brought together almost 600 junior high and high school students in two concerts Nov. 4 for its Symphonic Band and Concert Band performance, followed by the Nova Chorus, Cantabile Chorus, and Honor Chorus performance. Students, who were selected by audition to participate, engaged in two days of rehearsals under the leadership of world-class conductors and vocal and instrumental specialists, and attended a concert showcasing various Minot State University collegiate ensembles. MSU’s Division of Music sponsored the festival. The Minot State University broadcasting program’s 19th annual auction, held Nov. 30, raised more than $6,500. MSU students with guidance from Janna McKechnie, KMSU Auction coordinator, organized, produced, and promoted this unique fundraising event. The KMSU Auction promotes local businesses through various media in exchange for donations which are collected by students. The donations are then organized into packages and auctioned off on live television. Viewers call in to place bids on-air during an allotted time with the highest bid winning the package. "More than 160 donations were collected by students,” McKenchnie said. “The biggest draws this year were packages that contained a Canon Camera from SRT, a YMCA membership, and an MSU tuition waiver. All the donations were really appreciated. And the event gave students a hands-on opportunity to learn skills they can use after graduation." The students donated 10 percent of funds raised to the Magic City Discovery Center in Minot. For questions, contact McKechnie at janna.mckechnie@minotstateu.edu. Members of the MSU club, League of Social Sciences, donated $420 to the Minot State University World War I Centennial Memorial Fund. The money is being used to purchase a granite memorial bench and two elm trees, in memory of Minot State students Henry Finn and Fred Otis Cooper who fought in the war. Plans are to unveil the WWI Centennial Memorial in the spring. The Minot Symphony Orchestra celebrated Veterans Day in November with a concert to honor the armed forces. Many of the pieces performed had been inspired during times of war or have become symbols of self-reflection in coping with loss. Erik Anderson, a music professor at Minot State, gave a preconcert lecture, “Music in 3D,” prior to the concert. The Minot State College of Business invited all students to attend a networking strategy workshop with Molly Beck, author of the book "Reach Out," Nov. 28 in Aleshire Theater. Beck shared insights from her book, and each person left the event with their own personal networking plan tailored to the community they want to build around themselves. It’s that time of year again, time for the Minot Air Force Base cookie drive. The cookies are distributed to the nearly 1,200 first-term airmen living in the dorms on Minot Air Force Base. The airmen, between the ages of 18-20, are required to live in the dorm. For some, it is the first time they have been away from family for the holidays. Baking cookies is one small way to show appreciation to the men and women serving the country. The overall goal for the Minot community is 1,200 dozen, which means one dozen homemade goodies for each airman. Drop off homemade cookies at the Minot Chamber of Commerce office, 1020 20th Ave. S.W., between 9 a.m. and 3 p.m. Dec. 11-15. The cookies will be delivered to the AFB, then boxed and distributed. Please consider helping Minot display support of the young men and women of Minot Air Force Base. In 2000, Minot State University employees established the MSU Staff Senate Scholarship Endowment Fund. Initially, the fund started with a $5,000 deposit raised by Staff Senate through cookbook sales and MSU employee donations. The fund’s interest income will support scholarships to be selected from qualified applicants; the amount, number of scholarships, and recipients will be determined by the Staff Senate Scholarship Committee. The fund’s purpose is to assist staff or their dependents in their educational pursuits at the university. Dependents include spouses or unmarried children under the age of 24. To be classified as an employee’s dependent, the student must be claimed as an exemption on the staff member’s federal income tax return. Completed applications must be returned to the Financial Aid Office by 4 p.m. Friday, Dec. 15. To apply, visit the MSU Staff Senate Scholarship website. Employees that would like to give to the Classified Employee Endowment Fund should contact MSU’s Advancement Office to make a lump sum contribution or establish a monthly payroll deduction. Minot State’s Center for Extended Learning is offering four College for Kids camps during the holiday break. Staff and faculty qualify for a $10 discount per child for each camp they attend. The camps are Business of Babysitting, Fitness Fun for Kids, Catch Your Dreams, and The Art of YouTube Filmmaking. Spots fill quickly, and the deadline to register is Dec. 21. Visit College for Kids to register. For more information, contact Amy Woodbeck, community education coordinator, at 858-3989 or by email at Amy.woodbeck@minotstateu.edu. Photographer Meghan Kirkwood brings images of an arid grassland region in South Africa to Northwest Art Center viewers in “Historical Landscapes: South African Environments Through the Lens,” on display at the Gordon B. Olson Library Gallery through Dec. 29. “Enigma: Truth and Perspective,” a senior art exhibition showcasing the work of Minot State University student Cassandra Stauffer, will be on display at the Northwest Art Center’s Hartnett Hall Gallery through Dec. 29. Ash Bowen, Eric Furuseth, and Robert Kibler, all of English, had their creative works and essay accepted for presentation at the annual University of Louisville Conference on Literature After 1900. Bowen will read from a new selection of his original poems, and Furuseth will read his original short story, "Ah Youth, How I Myth(ologize) You!” Kibler will chair two panels on the American poet Ezra Pound, and will present "Between a Rock and a Pound: An Anthropological Overview of the Naxi Tribespeople of the Southern Himalayas and their Influence on Modernism." Libby Claerbout, International Programs director, has been appointed North Dakota state representative for NAFSA: Association of International Educators, the largest professional organization committed to international education and exchange. NAFSA members work to advance policies and practices that build global citizens with the knowledge and skills they need to succeed in today's interconnected world. Her two-year appointment starts Jan. 1, 2018. In addition, Claerbout co-presented an information session, “Meeting the Challenges of International Education in Small Rural Institutions,” at the NAFSA Tri-Regional Conference in Denver in November 2017. Leisa Harmon, assistant professor of communication disorders, presented "Supervising Paraprofessionals: No One Told Me About This in College" to the special education staff from Dickinson Public Schools on Nov. 21, 2017, in Dickinson. Kathy Hintz, associate professor of education, published two articles this summer. The first, “They are so Much More Capable than What we really Allow: Inclusive Beliefs, Practices, and Textbook Use,” was published in The Journal of Social Studies Research in July, 2017 and covers research in elementary classrooms. The second, “Creating and Evaluating First Year Experience Learning Communities in Teacher Education Programs,” was published in Learning Communities Research and Practice in June, 2017 and describes the Great Minds Think Alike First Year Experience. Holly Pedersen, associate professor of special education, and Dionne Spooner, Walden University, published "The Transformation Process of Fathers of Children with Disabilities: An Exploratory Case Study," in the Journal of Human Services: Training, Research, and Practice: Vol. 2: Iss. 2 , Article 5. It is viewable at: http://scholarworks.sfasu.edu/jhstrp/vol2/iss2/5 . MSU senior Jordan Torgunrud was selected as the CETL Student of the Month for October. She has contributed to the Center for Engaged Teaching and Learning’s programs as a peer tutor and peer mentor.